My Granny always cooked this wonderful, light soup in early fall after she harvested the last of the green beans from her garden. Garnish it with a dollop of sour cream and another tablespoon of fresh dill for an elegant first course or simple summer dinner. This soup is always more flavorful after it rests a day or two in the fridge. Heat a large skillet over medium high heat and add the olive oil. Add the onions and cook 4 to 5 minutes, until the onions start to soften. Transfer onions and green beans to the pot with the remaining potatoes. Simmer over low heat, until the green beans are tender, about 10 to 15 minutes. 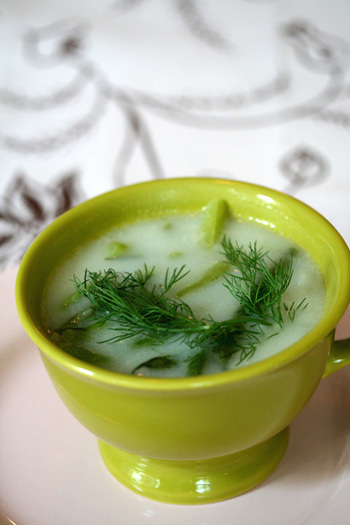 Stir in the skim milk and minced dill and season with salt. Nutritional Stats Per Serving (1 1/2 cups): 182 calories, 5 g protein, 32g carbohydrates, 3g fat (0 g saturated), 0 mg cholesterol, 4 g fiber, 175 mg sodium.